Announcing a weekend of public performances featuring Veracruz, Mexico based Son Jarocho master musician and poet Zenen Zeferino in collaboration with roots music ensemble the Lua Project. Luray, Va—Mexilachian Son is a multimedia project featuring extensive interviews with Latino immigrants in Central Virginia and the Shenandoah Valley. With support from Virginia Humanities, Lua Project artists Estela Diaz Knott and David Berzonsky documented the experiences of immigrants after settling in Virginia. Knott, Berzonsky, and Zeferino have now turned those stories into poetic verses and paired them with the music of traditional son jarocho songs. The resulting arrangements call upon both the Mexican and Appalachian traditions of the collaborating artists. Lua Project and Zenen Zeferino will be performing these pieces, along with a collection of original Mexilachian songs, at two public presentations in early May in Luray and Charlottesville. Saturday, May 11 from 3:30-5:00 P.M.
Sunday, May 12 from 3:30-5:00 P.M. The presentations will feature master jaranero, vocalist, and poet Zenen Zeferino. Zeferino is one of the most prominent performers and composers within the son jarocho tradition, an afro-mestizo musical form with roots in 18th Century Veracruz. He will be joined by Charlottesville based Appalachian and Mexican folk ensemble, The Lua Project, which features Estela Knott on jarana and vocals, Dave Berzonsky on requinto and bass, Matty Metcalfe on accordion and banjo, and Christen Hubbard on mandolin and violin. In addition to musical performances, the presentations will feature several of the interview clips that inspired the musical arrangements and an explanation of the poetic structure of son jarocho poetry and its distant cousin, the Appalachian ballad. 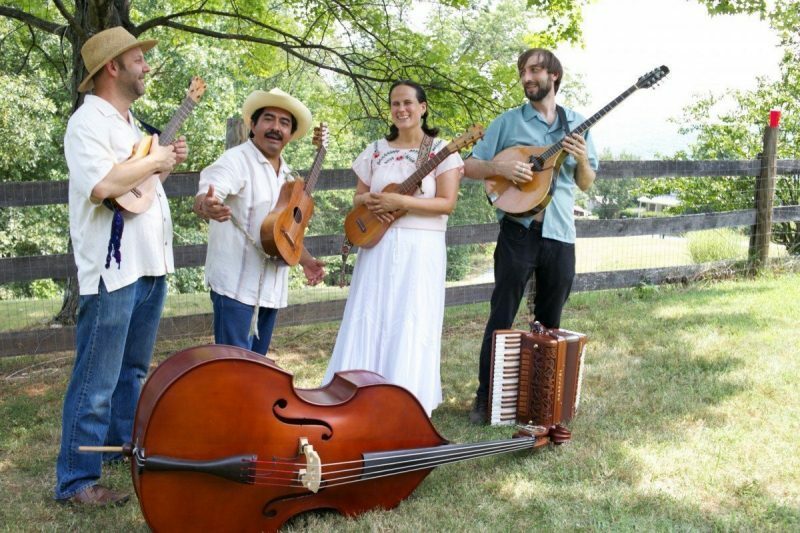 A discussion of the creative process and a demonstration of Appalachian clogging and its Mexican counterpart, zapateado, will follow. The answer for these artists was to marry son jarocho, a style rooted in a musical culture that is at least 200-300 years old, with new stories of the people who have come to Appalachia from Latin America. Zenen Zeferino was born in Jáltipan de Morelos, Veracruz, in a family of poets and singers, who for several generations have cultivated this form of musical and poetic expression, which has its natural space within the fandango tradition. This style has been kept alive to this day thanks to the cultural transmission through countless generations over hundreds of years. He is a skilled composer of verses who has cultivated the different poetic forms that the jarocho tradition offers. Besides being a skilled performer of the jarana, the principal accompaniment instrument of son jarocho, he is the possessor of an outstanding voice that has placed him in a privileged place among the singers of son jarocho, and is renowned as a lyrical improviser. In 2007 he was awarded the National Prize for Cultural Radio for his work as producer and host of the radio program El Sonoro Sueño in Radiotelevisión de Veracruz and in 2010 he wrote and edited the children’s book Zoóngoro Bailongo, Cuentos de Raíz Jarocha, in which he highlighted the importance of preserving traditions and of respecting and caring for animals and the environment. Estela Knott and David Berzonsky, based in Charlottesville, VA are two very experienced and effective performers, teachers and community bridge builders who have a deep love, appreciation and understanding of a multitude of global folk musical traditions. They began their journey together performing with renowned Malian griot and ngoni master Cheick Hamala Diabate, and in their 21 years together have travelled and performed throughout North and South America, and have engaged in extensive study of folk music from Mexico, Peru, and Brazil, performing and recording with artists throughout the Americas. More recently, they run Blue Ridge Music Together, which has worked with hundreds of Charlottesville area families teaching family oriented music classes, perform together in the Lua Project, which is an original music ensemble that blends elements of Latin and Appalachian song traditions. David also plays upright bass with the acclaimed Gypsy jazz ensemble, The Olivarez Trio.